As we continue to gain a deeper understanding of how our actions affect the earth, more Americans are embracing eco-friendly practices. Green building products have become more popular for this very reason. But you don’t have to remodel your home to incorporate environmentally friendly building products into your daily routine. 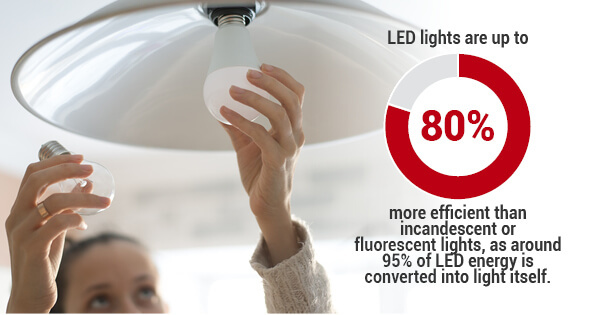 Using LED lighting in lieu of traditional light bulbs can be a great way to help the environment. But did you also know that LEDs may actually be better for your own health, too? Let’s take a closer look at the ecological and medical benefits that LED lighting systems can provide. They’re energy efficient: Of course, one of the main reasons consumers opt for LED bulbs is the energy efficiency they offer. LED lights are up to 80% more efficient than incandescent or fluorescent lights, as around 95% of LED energy is converted into light itself. Only 5% is wasted as heat, which is essentially the reverse of what you’ll get with fluorescent bulbs! LEDs also require less power than other types of lighting, which means you can use a bulb with lower wattage to create the same level of light. That means you’ll require fewer lights in general, which decreases greenhouse gas emissions. They last longer: Having to frequently replace your light bulbs is a real pain, both to your pocketbook and to the planet. But LED lights last up to six times longer than traditional bulbs do. This means you’ll use fewer lights over a given period of time, which translates to less waste and fewer resources needed to manufacture, package, and transport these bulbs in the long run. Not only will this reduce carbon emissions, but it’ll also ensure you’re always able to see clearly without straining your eyes. They don’t contain toxic chemicals: People who are the most susceptible to pollution’s adverse effects tend to spend more time indoors overall. But staying inside doesn’t always mean you’ll be safer or healthier. If you use fluorescent lights in your home or office, for example, you could be exposed to noxious chemicals like mercury. These chemicals can penetrate your environment and cause problems with your vision and concentration. These lights will eventually be disposed of in landfills, where they can present health hazards to the general public. But LED lighting contains no toxic elements. This means they won’t do harm to your personal health and can safely be disposed of at the end of their long life. They’ll wake you up AND help you sleep: You might not have realized that LED lights can actually help to support your body’s natural circadian rhythm. Thanks to technological advancements, LED lights can now be configured to emit blue wavelength light (which can help you feel more awake and productive during the day) and mimic natural, warm-toned light (which can increase melatonin production to help you sleep better at night). LED lighting systems can be designed to transition between the two types to normalize your body’s internal clock. You’ll experience a more restful sleep and will wake up feeling refreshed and ready to tackle anything. They can reduce headaches: Fluorescent bulbs can be harsh and are known to flicker. Light flicker has been found to cause headaches and other health problems, as well as lowered productivity. If you suffer from frequent migraines or stress headaches, you may want to consider switching to LEDs. These lights don’t flicker and produce more natural-looking light, which translates to improved moods and a decreased frequency of headaches. They can ease stress: Human-centric lighting, or HCL, has been found to improve melatonin levels and general mood through variable lighting wavelengths. HCL is now being explored as a possible treatment for those who have been diagnosed with depression or anxiety disorders. LED lights are just one type of lighting that can provide these positive effects. But even if you’re having a stressful day, LED lighting can help. Because spending time outside is known to reduce stress, having a more natural lighting option can ease anxiety. For these reasons, you should consider swapping out your traditional bulbs for LED lights. Both your body and the earth will thank you if you do. Marmoleum: What Is It Made Of And How Is It Made?